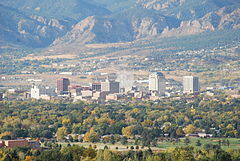 Is é Colorado Springs an dara cathair is mó in Colorado, Stáit Aontaithe Mheiriceá. Tá Colorado Springs suite i gContae El Paso, agus tugtar an leasainm "The Springs" air. Tá Steve Bach ina méara ann. Bunaíodh an chathair sa bhliain 1871.
www.springsgov.com - Suíomh idirlín oifigiúil. Tugadh an leathanach seo cothrom le dáta an 1 Iúil 2017 ag 15:58.